Can you go to negative life at any point? 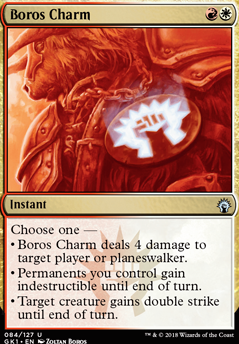 Boros Charm deals 4 damage to target player. 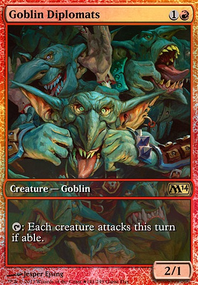 Permanents you control are indestructible this turn. Hey jconeil1988, I thought Puresteel was already in the deck :) If you have him definitely add him. 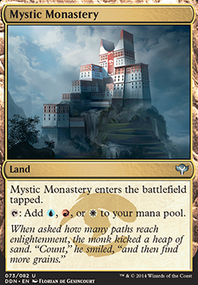 I thought you were playing the artifact lands specifically to activate metalcraft with Puresteel? You should check out new Feather, the Redeemed . This Angel is very good with Aurelia. She holds equipment very well especially Sunforger. It doesn't matter what creature you control who you target with an instant or sorcery as long as the spell targeted a creature you control it will trigger Feather's ability. The card you exiled is returned to your hand at the beginning of the next end step. This includes your opponents end steps which is amazing. Obviously a deck built around Feather as the Commander is going to be better suited to abuse her ability especially being able to do Commander damage. 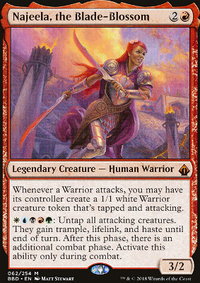 Feather is just a good card to play in any Boros deck, 3/4 flying for three mana, but beyond the good stats she gives you card advantage which outside of Sunforger Boros lacks a lot of. The interaction of Feather and Sunforger is great because you cast the instant you tutor for with Sunforger which triggers Feather's ability. There's a package of cards that are busted with Feather ( Balduvian Rage , Expedite , Defiant Strike , Shelter , etc.) and unfortunately there's not enough deck space for most of them and you don't really need them with Aurelia. Combining the strategies of Feather, Aurelia and Sunforger however would be a nice challenge because Aurelia, Feather and Sunforger are three of the best Boros cards to play. Magnetic Theft is very good with Feather, Sunforger and other equipment, repeatedly each turn letting you bypass the equip cost of an equipment. Puresteel also does this, but Theft is an instant and Sunforger can tutor for it, can cast it, meaning you can equip at instant speed. 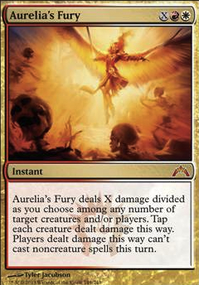 Aurelia's Fury is already in your deck and it's powerful with Feather because you can choose what targets take damage. Target Feather, doing 1 damage to her and then do the rest of the damage depending on how much mana you paid to other targets. Since you targeted and did 1 damage to Feather this doesn't kill her and it triggers her ability letting you repeatedly use Fury. Boros Charm is a staple card for Sunforger packages and it's just as good with Feather because one of it's modes lets you target a creature giving it double strike. The combination of Mistveil, Feather's ability and Sunforger gives you a ton of resiliency with instants and sorceries. Seize the Day is also powerful with Feather because it targets a creature you control to untap which triggers Feather's ability. With Feather, Aurelia and Siege you can get three combat phases a turn. First attack with Aurelia this triggers her ability getting a second combat phase. After the second combat, at your second main phase, cast Siege targeting either Aurelia or Feather to then get another combat phase as well as a main phase and trigger Feather. Cloudshift is another good spell with Feather and Aurelia to get three combat steps on your turn. Attack with Aurelia triggering a second combat phase then blink Aurelia with Cloudshift. Aurelia ETB as a new instance which means you can then attack at your second combat phase with new Aurelia and then get another combat phase, the third one of your turn. Three combat phases for one mana is pretty good. 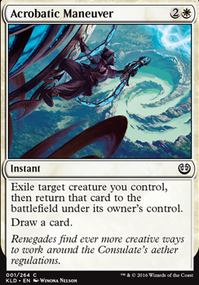 Add Feather and you can repeatably use Cloudshift and do this interaction each turn.